Perth local Shaun Norris is one of the most accomplished athletes on the Australian Rollers squad, racking up a long list of accomplishments on the world stage including three Paralympic Games and two World Championships titles. At the young age of four, Shaun was hit by a car while riding his bike. Having acquired a spinal cord injury at his T11/12 vertebrae, he was left an incomplete paraplegic. While Shaun didn’t find his way to wheelchair basketball right away, it wasn’t long after his rehabilitation that he began swimming and found his competitive edge. Shaun relocated to Perth from Brisbane at the age of ten and quickly discovered a passion for wheelchair basketball after getting involved in wheelchair sports. Citing the team environment as a factor that attracted him to the sport, he soon found he had the skills and speed and loved how aggressive he could be on court. Since then, Shaun has enjoyed an illustrious career as a wheelchair basketballer, having made his debut with the Rollers just five years later in 2000. He made his Paralympic debut at Athens 2004, where the Rollers lost the spot on the gold medal podium to Canada, which only made him hungrier to succeed. Shaun was determined not to repeat history in the lead up to Beijing, and helped the team win gold, defeating Canada 72-60. In a fascinating Paralympic battle with Canada, the tabled turned away from the Australians again in London with the Rollers losing the gold medal match to Canada to come away with silver instead. Shaun played outstandingly in London, notching up 44 points to become Ausrtalia’s second highest point scorer behind Justin Eveson. Shaun has been part of every Rollers team since 2004 and outside of the Paralympics, has played a key role in the team’s back-to-back World Championships titles in 2010 and 2014, as well as the 2009 and 2011 IWBF Asia Oceania Championships, the 2009 Rollers World Challenge, the 2009 Paralympic World Cup and 2015 Asia Oceania Zonal qualifiers – all of which resulted in the Rollers winning gold. 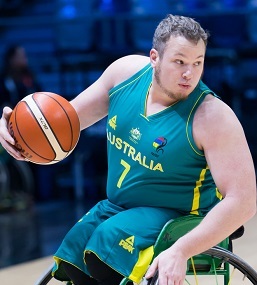 Nicknamed ‘The Wizard’ by his teammates for his wizard-like ways on the court, Shaun also plays wheelchair basketball for the Perth Wheelcats and has played professionally overseas in Italy and Spain. Off the court, Shaun enjoys relaxing with his friends and family and counts himself as a motor sports enthusiast, following car racing and participating in go-carting. The West Australian is an IT expert and has completed a degree at the Australian Institute of Commerce and Technology.